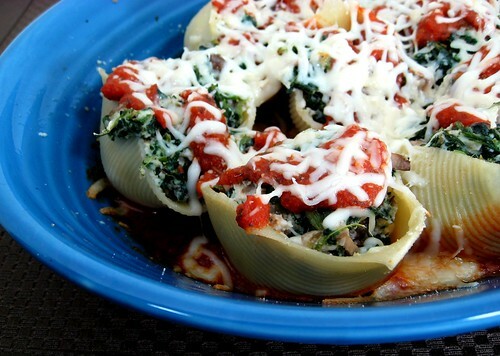 Spinach and Mushroom Stuffed Shells – Elly Says Opa! Let’s take a break…at least for a while…from all the sweets. I swear, just looking at this blog lately makes my teeth ache, and as for actually eating all the things posted, well, that hasn’t really helped any other part of my body. One thing I’d like to do more of this year (much to Tom’s dismay) is eat a few more vegetarian meals here and there. Although I do think of pasta as the cliché vegetarian main dish, you have to work in somewhat clichéd ways in order to trick your husband. Not that Tom was fooled by the lack of meat in this dish, but with the mushrooms, spinach, and cheese all in his favorite carb ever–pasta–he certainly didn’t complain. I don’t really make stuffed shells often because I have never been able to find whole wheat shells (at least, not large ones) at the store. If anyone knows where to find this very elusive whole wheat product, please let me know. I think this will just have to be one pasta product that I eat enriched, albeit infrequently. For the record, the other is orzo. There is something distinctly bizarre and horribly gummy about whole wheat orzo–at least the couple varieties I have tried–so there will be no more of that for a while, either. I really loved these shells, as I love anything with mushrooms. I think a smoky mozzarella or fontina would add another layer of flavor that would make these even better. I’m submitting these over to Gay from A Scientist in the Kitchen, who is hosting Presto Pasta Night. As I’m sure you all know by now, Ruth from Once Upon a Feast is the creator of PPN and I always look forward to the round-ups! Preheat the oven to 350. Cook the shells in salted water to al dente. Heat the olive oil in a large skillet over medium. Add the mushrooms and cook until they have released most of their juices. Stir in the shallots, garlic, and salt and pepper. Continue to cook, stirring frequently, until the moisture from the mushrooms has been evaporated and the shallots are tender. Scoop into a large bowl. After it’s cooled slightly, add the thyme, oregano, basil, spinach, egg, ricotta and 1/3 cup of the parmesan. Mix to combine all the ingredients well. Pour about 1/2 cup of the pasta sauce into the bottom of a large baking dish. Stuff each shell with 1-2 Tbsp. of the stuffing and place in the baking dish. 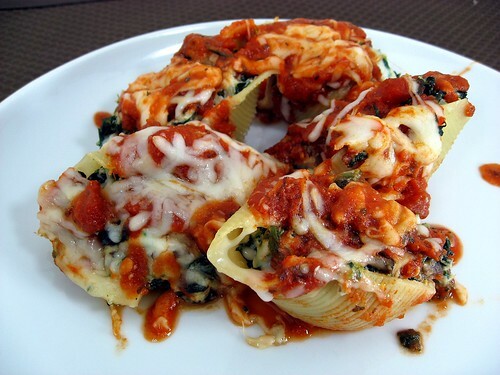 Pour the remaining sauce over the shells and sprinkle the mozzarella and remaining parmesan cheese on top. Cover with foil and bake for 20 minutes. Remove the foil and bake for 5-10 more until the cheese starts to brown.